The President & Members of San Remo Bowls Club Inc are proud to present a fully serviced bowling club in the heart of San Remo, to cater for all your bowling and entertainment needs. We welcome you to the best bowling club in the district with new greens laid in late 2005. The outstanding facilities include a spacious air conditioned club room available for hire for your special function. The room is suitable for any occasion with professional catering and licensed bar staff. With competition quality greens and a myriad of outstanding facilities, the San Remo Bowls Club Inc invites you and your guests to experience the proud traditions of one of Bass Coast Shire's most prestigious bowling clubs. 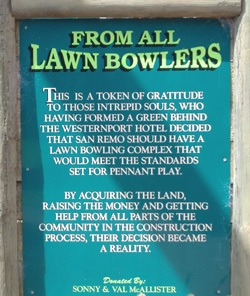 San Remo Bowls Club Inc. Copyright © 2007 San Remo Bowls Club Inc. All Rights Reserved.